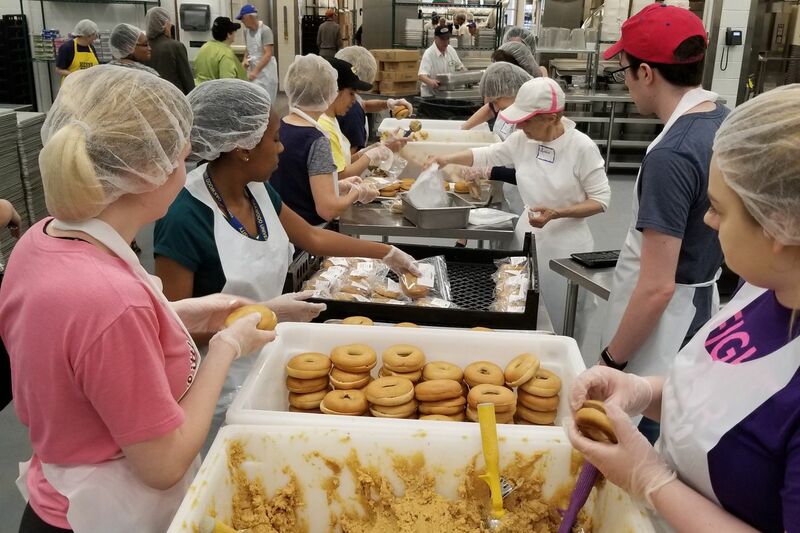 Volunteers at MANNA make sandwiches using whole wheat bagels and hummus. Feliciano Pagan stood at his front door when the MANNA food truck pulled up to his two-story brick rowhouse. Pagan, 48, greeted the driver with a smile as he carried in two large bags filled with frozen dinners and fresh fruit that would last a week. Among the goods were chicken fajitas with brown rice and zucchini; chicken dumplings, carrots and beets; and sweet and sour pork chops with turkey noodle soup. Since 2015, Health Partners has joined a small group of insurers around the country to offer some members specially designed meals to improve their health. The company paid the full cost for 560,000 meals to be delivered to more than 2,100 of its members with conditions such as diabetes, heart disease, and kidney failure. The Metropolitan Area Neighborhood Nutrition Alliance (MANNA), a Philadelphia-based nonprofit organization that provides medically appropriate food for people with serious illnesses, prepares and delivers the meals. The service covers three meals a day and typically lasts six weeks, although members can renew for two additional six-week cycles. It also provides nutritional counseling. MANNA provides the meals to everyone in the household to help family members support patients who need to change bad diets. Health Partners, which serves Philadelphia and nearby counties, said its investment is paying off. An example of one of MANNA’s meals. With the kick start that comes from receiving these free meals and continued counseling to shop better and prepare healthy meals, the members are better able to control their diabetes, use the hospital less, and reduce their medical costs, according to the health plan. "We wanted to see how this would work out, and we are quite pleased that with the cooperation of our members we did see a dramatic reduction in their costs … and improved outcomes," said William George, CEO of Health Partners. George would not disclose how much his health plan pays for meals, although one industry expert said it costs less than $15 a day per member. The growing number of "food as medicine" programs nationally are aimed at improving nutrition among adults with serious illnesses to help them heal, recover from medical procedures, and control chronic diseases. Aetna and two other insurers also have added the benefit for their Medicaid enrollees in the Philadelphia area. California's Medicaid program in May began a three-year pilot project to provide meals to several thousand adults with chronic diseases. In New York, the nonprofit group God's Love We Deliver provides medically tailored meals to two dozen Medicaid-managed long-term care plans. Despite the success of these food programs, they are not standard benefits in Medicare — the federal health program for seniors and disabled people — or Medicaid — the state-federal health program for low-income people. Advocates say efforts to expand the programs are stymied by concerns about the cost and public resistance to a government health program providing free food. But private Medicaid and Medicare plans have discretion to spend their government funding on services outside direct medical care. Proponents of these meal services are trying to persuade more of the private plans to adopt the programs. Karen Pearl, CEO of God's Love We Deliver, said while it may seem obvious that giving people healthy meals will help them get well, it's still a huge change for plans focused on paying for doctor visits, hospital care, and drug benefits. "For plans trying to care for high-cost members, sometimes it's hard to carve out money from the medical model, as nutrition has not always been front of mind," she said. A recent shift among government and private insurers to pay doctors and hospitals to keep people out of the hospital could give this approach a boost, according to experts. A study published in Health Affairs in April found providing tailored meals for at least six months in a Massachusetts Medicaid health plan reduced ER visits, hospital admissions, and health spending compared with adults who did not receive an intervention. "Telling someone to go to the gym and eat healthy does not work anymore," George said. People either don't know how to eat nutritious meals, don't have easy access to healthy food, or can't afford it, he said. Feliciano Pagan looks over his medically tailored meals made at the kitchens of the nonprofit MANNA and paid for by Health Partners Plans, his Medicaid health plan. That was the case with Pagan, whose blue-collar neighborhood has fast-food restaurants but lacks a larger grocery store with a broad array of fruits and vegetables. Pagan has had heart valve surgery and may soon need a heart transplant. His doctors have told him to cut back on greasy food, but he said he didn't know how until Health Partners offered him the special meals. "It's hard not knowing what foods to eat," Pagan said in May just after he received his latest meals from MANNA. MANNA uses a team of chefs and hundreds of volunteers to prepare the meals from scratch at its headquarters in central Philadelphia. Meals are tagged with a colored sticker depending on which of 11 types of diet they meet — such as low-calorie, high-protein, or low-salt. Unlike the Meals on Wheels America service, which provides meals to seniors across the country on a sliding fee scale, these specialized meals vary based on each person's health status. MANNA CEO Sue Daugherty said getting insurers to cover the cost of meals is vital to expanding her group's reach, which otherwise relies on philanthropic support. About 375 of its 1,300 clients are now covered by Medicaid health plans. It has been challenging to get insurers to look at the meals as a way to save money, Daugherty said. Sue Daugherty, CEO of MANNA, holds medically tailored meals in the nonprofit’s kitchen in Philadelphia. "We think of food as medicine and want folks to have access to their prescribed diet just like they do for a prescribed medication," she said. For example, she added, cancer patients undergoing chemotherapy often have little appetite, so getting them meals rich in calories and protein is important to keep up their strength. George said another key is nutritional counseling so members can learn to make better choices in the supermarket and prepare healthy meals themselves. "We don't have the resources to feed everyone forever," he said. There's little research on how people's health fares after they stop getting the medically tailored meals, said Seth Berkowitz, an assistant professor of medicine at the University of North Carolina, who co-authored the Health Affairs study. Although there's little controversy that giving people nutritious meals is good for their health, more research is needed to determine who are the best candidates for these programs and how long they should last, he said. Marina Rangel, 53, of Philadelphia, credited the meals she received in 2016 through Health Partners for getting her back on the road to health. At the time, she weighed 400 pounds and could barely move around her home. After five months of receiving meals and counseling, she lost 45 pounds, which encouraged her doctors to give her a hip replacement. Today, her weight is down to 245, her diabetes is under control, and she works at home selling antiques on eBay. "It's been amazing, lifesaving for me to be in the program," she said. This story is part of a collaboration between the Inquirer/Philly.com, WHYY-FM's The Pulse, and Kaiser Health News, a nonprofit news service covering health issues. It is an editorially independent program of the Kaiser Family Foundation that is not affiliated with Kaiser Permanente.